These classic myths from the Greek pantheon are given a modern twist that contemporary tweens can relate to, from dealing with bullies like Medusa to a first crush on an unlikely boy. 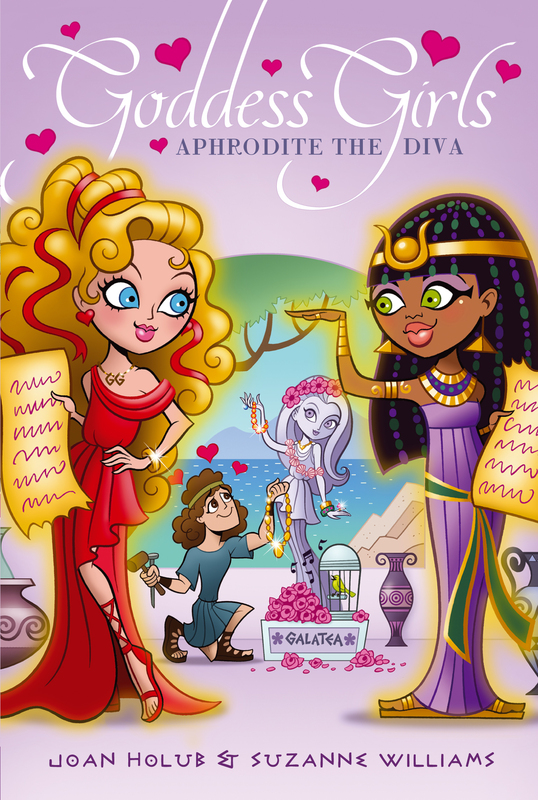 Goddess Girls follows four goddesses-in-training – Athena, Persephone, Aphrodite, and Artemis – as they navigate the ins and outs of divine social life at Mount Olympus Academy, where the most priviledged gods and goddesses of the Greek pantheon hone their mythical skills. In book 6, an exchange student from Egypt, Isis, is encroaching on Aphrodite's match-making turf. Will she also edge Aphrodite out of her group of friends? I’M FAILING HERO-OLOGY? APHRODITE STOOD in the middle of the Mount Olympus Academy gymnasium and stared at her grade in shock. That can’t be! she thought. She closed her sparkling blue eyes and opened them again, hoping she hadn’t seen right. Unfortunately the D was still there. Okay, so a D wasn’t exactly failing. But it was close. She glanced around and saw mean-girl Medusa eyeing her in a nosy way from across the gym. Uh-oh. Quickly, she stuffed the reportscroll into the pocket of her new chiton. She’d work on somehow getting her grade changed later. But for now she’d better do what she’d come here for and get out fast before any-one asked about her grades. She couldn’t let anyone find out about this. Plenty of students at MOA thought that anyone who was beautiful was automatically an airhead. She didn’t want to reinforce the idea. Besides, it wasn’t true! Absently, she fluffed her long, naturally wavy golden hair. Sure, everyone said she was the prettiest goddessgirl at the Academy. But one bad grade didn’t mean she was D for dumb. Right? With her eyes glued to the giant game board which now hogged the center of the gym, Aphrodite hurried toward it. The board was normally set up in Mr. Cyclops’s Hero-ology classroom. It had been moved here for a party to celebrate Hero Day. Today’s party kicked off the start of Hero Week, a five-day school break. “Excuse me. Sorry. Pardon me,” she said, weaving through the throng of students between her and the game. Every godboy she saw was instantly dazzled by her smile and moved aside for her to pass. Whew! The gym was packed. Hero-ology was a required class, so every student at MOA had gathered here. She’d arrived late because she’d zipped down to the Immortal Marketplace bright and early for gift wrap and lost track of time. A window display had caught her eye and she’d wound up trying on one chiton after another. Could have happened to anyone, right? Eventually, she reached the game board, which covered the top of a table about the size of two Ping-Pong tables set side by side. Its three-dimensional world map showed colorful countries dotted with castles, villages, roads, and hills. The countries were surrounded by oceans filled with small sea monsters, mermaids, and scaly dragons that really moved! Unfortunately, the statue of Paris, her valiant mortal hero, had been set on the far side of the game board on Mount Ida in Asia. Aphrodite glanced back toward the gym door, wishing she could escape now. But she couldn’t leave without giving Paris the gift she’d brought for him. Clutching her pink shopping bag, she began to pick her way around the edge of the huge game. Out of the corner of her eye, she saw one of her best friends, Athena. They waved to each other, wiggling their fingers. Athena’s reportscroll was clasped to her chest and her face glowed with pride. Since she was the biggest brain in school, it was a no-brainer to guess that she’d made an A. Hearing a whoop, Aphrodite looked over to see Apollo high-fiving with Artemis, another of her best friends. Obviously, the brother-sister twins were happy with their grades! Even Dionysus, who was a major goof-off, was proudly showing around his C. He’d done better than she had? No fair! Acting in school dramas and playing in Apollo’s band were the only things he took seriously. Other than that, he pretty much joked around all the time. Well! She didn’t think she deserved a D. And as soon as could, she was going to have a talk with Mr. Cyclops about changing her grade. Aphrodite breathed a sigh of relief when she finally reached the far side of the game board. She dug into her shopping bag and took out a package wrapped in sparkly paper and tiny corkscrew ribbons. It was the gift she’d chosen to reward Paris. She set the shield on the game board next to him. Everything they did to their statues actually happened to the corresponding real mortal heroes living far below on earth. So that meant the life-size, living, breathing Paris had just received a big gold shield like this miniature one from her. And he could hear her voice, too, as if she was whispering in his ear. Their class assignment had been to send their heroes on quests. Instead, she’d accidentally helped Paris start a war. One teensy-weensy little mistake. Was that why she’d gotten a—gulp—D? Thinking about it made her remember that she was in a hurry to get out of there. A green hand fell on her arm. “Hey, how’d you do?” asked Medusa, stepping between her and the door to freedom. Aphrodite stopped dead, staring at the snakes that grew from Medusa’s head in place of hair. They flicked their forked tongues in and out as they stared back at her with beady red eyes. Momentarily mesmerized by them, Aphrodite didn’t say a word. “Earth to Bubbles.” Medusa snapped her fingers to get her attention. Aphrodite’s eyes flew to Medusa’s face. “Stop calling me that.” She hated the nickname. It was kind of embarrassing that she’d been born from sea foam, and some people never let her forget it. “I got a B,” Medusa said with a self-satisfied smirk. Behind them, two godboys—Apollo and Ares—pushed their way up to the game board. Then they began noisily racing their heroes up and down the Mediterranean Sea in miniature ships. Several other students gathered to watch. “Yeah, Aphrodite’s better at starting wars than anyone I know,” added Ares. His eyes sparkled as he grinned over at her. Aphrodite couldn’t tell if he’d meant that in admiration, or if he was teasing. As the godboy of war, he actually might think that starting a war was a good thing! “Huh?” Aphrodite huffed, drawing back in surprise. What was she talking about? “I think it’s nice that she wanted to help Paris find love,” Persephone interrupted, coming to stand beside Aphrodite. Persephone, Athena, Artemis, and Aphrodite were all best friends, as well as the most popular goddess-girls at MOA. It was nice that her friends stuck up for her and their words gave Aphrodite a warm feeling. Still, what Medusa had said about the earthbound mortals’ disappointment in her was troubling. “That comment was so not helpful,” Aphrodite informed him. She’d had an on-and-off crush on Ares all year long. No surprise. After all, he was tall, blond, and muscled—easily the cutest boy in school. But recently things had been even rockier between them than usual. So rocky that she was sure she was over him now. Very sure. Everyone cringed and looked upward. The gym’s domed roof was open to the sky, which was quickly filling with dark, angry clouds. A tremendous storm was blowing in, seemingly out of nowhere. Outside, hail the size of fists began to fall. “Pull the roof!” Mr. Cyclops yelled. Ares, Apollo, and several other godboys rushed to begin tugging on the long ropes that operated the movable roof cover. Other students ducked under the bleachers to avoid the first raindrops that were falling in through the open roof. Once the cover was in place, everyone, including Aphrodite, rushed to the windows and doors to peer outside. “Not again!” she heard someone mutter. It sounded like Athena. Outside, Principal Zeus was stomping his way across the sports field. Since he was nearly seven feet tall with bulging muscles, a bushy red beard, and piercing blue eyes, he was a scary sight even on a normal day. In a bad mood, he was terrifying. And right now he seemed to be in a very, very bad mood, indeed! His expression was fierce and his meaty hands were balled into fists. Wild storm winds whirled around him, whooshing scrolls out of passing students’ hands, tangling their hair, and whipping at their chitons and togas. Thunderbolts crashed toward the ground, tearing up grass and splitting trees. Aphrodite glanced at Athena. Aside from being King of the Gods, Ruler of the Heavens, and the principal of MOA, Zeus was also Athena’s dad. Not surprisingly, her friend looked upset and a little embarrassed. It had to be hard for her to see him so angry. Aphrodite reached over and gave her hand a quick squeeze. Then she looked around for Mr. Cyclops. Apparently unfazed by the commotion outside, he was sitting alone at the table that held the Hero cake and other refreshments. Recognizing a chance to ask about her grade, and fueled with determination, she headed in his direction. “Do you have a minute, Mr. Cyclops?” she asked sweetly. He’d been studying his grade book, and when he peered up at her, she jumped back in surprise. His humongous single eye appeared even more humongous than usual. He was wearing new glasses! Since he had only one eye in the middle of his forehead, there was only one lens, and it magnified his giant eyeball to twice its normal size. He ducked his head as if he felt self-conscious about the new glasses, or rather, glass. “Nice specs . . . er . . . spec,” she said, trying to put him at ease. “Yes, well, my eyesight isn’t what it used to be.” He removed the glasses and laid them on his desk. “Um . . .” she hedged. How had he guessed? Aphrodite toyed with the GG charm—GG for Goddess Girl—that dangled from her golden necklace. Unfortunately, she knew that what Mr. Cyclops said was true. He had asked her to come by to chat earlier in the semester, but she’d been busy with her social life and hadn’t gotten around to it. After all, what was more fun—shopping and hanging out with friends, or getting scolded by a teacher after school? Duh. She darted a glance toward the other students. They were all still clustered around the windows and doors, peering out at Zeus. While their attention was on him, maybe she had enough time to make Mr. Cyclops see reason. “Diva?” Aphrodite flipped her long, lustrous golden hair over her shoulders, eyes sparkling with annoyance. Medusa had just called her the same thing. Obviously, they didn’t know what they were talking about! Another terrible crash drew their eyes to the entrance just in time to see one of Zeus’s thunderbolts soar past. There was a loud crack as it struck a sundial in front of the gymnasium. “You think it’s my fault Principal Zeus is in a bad mood?” Aphrodite turned her head from the door to look at her teacher, but his chair was empty now. Aphrodite wanted to ask what flack was. She figured it must be something icky since each mention of the word got Mr. Cyclops more and more worked up. But before she could ask, he went on. Aphrodite winced, hoping no one had heard him. “What if I can figure out a way to convince mortals to forgive me for starting the Trojan war—um, incident?” she asked, beginning to feel desperate. “Nothing makes people happier than being in love,” Aphrodite said quickly. Mr. Cyclops studied her for a moment. Then he put on his glasses, and leaned toward her like he’d reached a decision. Aphrodite held her breath, hoping. “Let’s hope your enthusiasm translates into results,” said Mr. Cyclops, in a voice that told her he wasn’t truly convinced. But she’d show him. As she left the gym and headed outside, her optimism was high. If she had to be stuck here during the break, at least she’d be doing what she loved best—matchmaking. Still, Hero Week was only five days long. She would need to do some fast advertising of her Lonely Hearts Club to get things rolling. Fortunately, she knew exactly who could help her with that. Pheme, the goddessgirl of gossip.